I hope you find great value in these Quotes about Obstacles from my large collection of inspirational quotes and motivational sayings. Obstacles are like wild animals. They are cowards but they will bluff you if they can. they will slink out of sight. before which difficulties disappear and obstacles vanish into air. as by the obstacles which he has overcome. you see when you take your eyes off your goals. Obstacles are things a person sees when he takes his eyes off his goal. The River of Life knows no obstacles. The River can cut through solid rock - in its own time. Overcome obstacles - grow and bloom anyway. and do something about them. half the strength you think they have. possesses the only strength which can overcome adversity. and that is the basis of all human morality. We have a choice of how we view the obstacles on our life path. to follow our dreams - and our happiness. a mental picture of yourself as succeeding. Hold this picture tenaciously. Never permit it to fade. Do not build up obstacles in your imagination. and endure in spite of overwhelming obstacles. The River of Life has no judgments. The River flows with no concept of good and bad - right and wrong. or flooded and covered with silt, and the River just flows. or they may founder in a storm and drown, and the River just flows. The River of Life is timeless. and it changes in its own time. I will greet this day with love in my heart. And how will I do this? Henceforth will I look on all things with love and be born again. yet I will love the rain for it cleanses my spirit. yet I will love the darkness for it shows me the stars. yet I will endure sadness for it opens my soul. yet I will welcome obstacles for they are my challenge. no better, no worse, no love, no hate, no fear, no anger, no joy. The River of Life just IS. There is nothing to do. There is nothing to say. There is nothing to think. There is nothing to feel. the source of all obstacles. The River is the source of all life - the source of all death. The River is the source of all joy - and the source of all sorrow. Yet the River has no joy - and the River has no sorrow. The River is just the River. and the River just flows. and the River just flows. There is nothing to do - and the River flows. There is nothing to say - and the River flows. There is nothing to think - and the River flows. There is nothing to feel - and the River flows. The River flows - and all else is our drama. The River flows - and all else is our invention. littered with all kinds of obstacles and problems along the way. You have to learn how to overcome them to be successful in life. and exact a motive power out of the greatest obstacles. it probably doesn't lead anywhere. Real obstacles don't take you in circles. Invented ones are like a maze. to determine your values and goals. Think of using all obstacles as stepping stones to build the life you want. Real talent will get through whatever the obstacles. has no desire to surmount it. she answered, except the lack of a minister's wife. If you're trying to achieve, there will be roadblocks. I've had them; everybody has had them. But obstacles don't have to stop you. If you run into a wall, don't turn around and give up. happiness in life without obstacles to conquer and goals to achieve. which difficulties disappear and obstacles vanish. has become one of the chief obstacles to intelligence and freedom of thought. while oblivion is the reward of the former. The best people I know have had a lot of obstacles to overcome. one may unfailingly arrive at his chosen goal or destination. some act of vision, of faith, of desire. Practice is a means of inviting the perfection desired. objectives despite all obstacles and barriers. but impossible to stop them. But the cure for most obstacles is, Be decisive. Obstacles don't have to stop you. Obstacles are seldom the same size tomorrow as they are today. obstacles to the realization of desires. the hurdles and obstacles that face me. There still is plenty out there to get motivated by. We have to embrace obstacles to reach the next stage of joy. Raising a family is difficult enough. But it's even more difficult for single parents struggling to make ends meet. They don't need more obstacles. he will reach them in spite of all obstacles. has been one of the principal obstacles to its improvement. and no victory is more satisfying than the one achieved against opposition. I've learned at the book signings that everyone has obstacles. and everybody goes through that. our minds to walk boldly through them. between them and personal happiness. the right answer or do the right thing every single time. after many struggles and countless defeats. I have a message for the young kids. Life is about obstacles, endeavors in life are not to be overlooked. the many obstacles put in your path. and when got, the repose is insupportable. is like putting out the eyes. there are ways to except them and to live through them. it seemed that the root cause of them all was fear. Sports is a metaphor for overcoming obstacles and achieving against great odds. Athletes, in times of difficulty, can be important role models. strength to persevere and endure in spite of overwhelming obstacles. that will confront them in almost every walk of life. there's usually an intuitive assumption underlying them that's wrong. The obstacles are all there; there are a million of 'em. obstacles to progress in philosophy. Wanting something is not enough. You must hunger for it. to overcome the obstacles that will invariably come your way. let us try to change the obstacles to advantages. Therefore keep in the midst of life. I don't really think in terms of obstacles. My biggest obstacle is always myself. is full of different kinds of experiences. and complete the cleansing process. 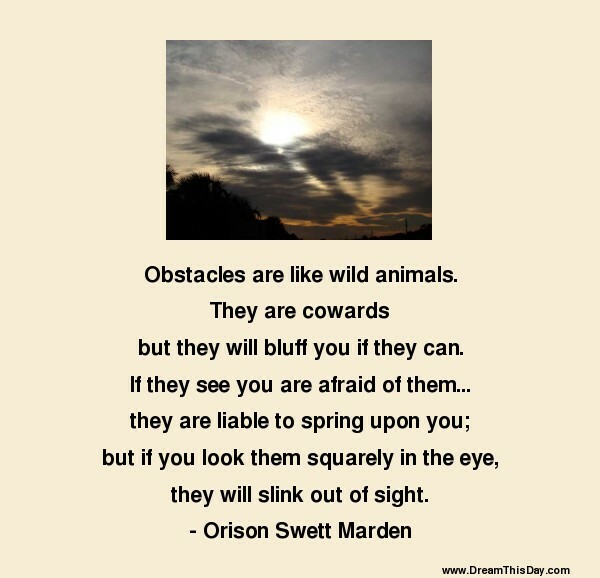 Thank you for visiting: Obstacles Quotes.